The beauty of maple leaves in autumn is such a great gift of the nature. Most Japanese maple trees are hardly associated with the concept of harvest as sugar maples may be. Instead, in my very subjective view, they are there just to embody the elegant beauty of changing seasons. As the harvest season nears the end, the gorgeous maple leaves generously color the world so that we can appreciate the precious moments before the arrival of barren winter. The multi-colored maple leaves are often called momiji in Japanese. Momiji originally meant "(any kind of) leaves turned into various colors (not only red but including yellow or brownish orange) in autumn," thus it was not an official name of a specific plant. 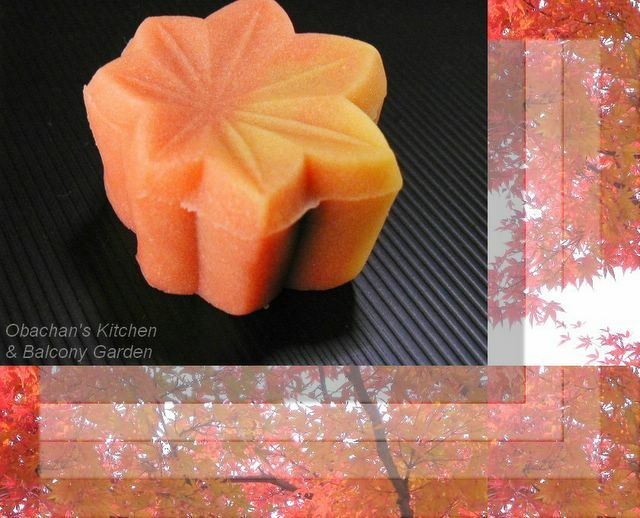 These days, the word momiji is generally associated with autumn maple leaves. 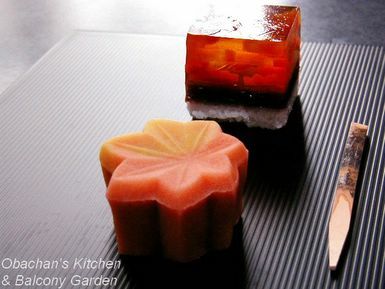 The wagashi in the photo is a layered kanten (agar-agar) jelly, which I think represents maple leaves floating on a gentle stream. 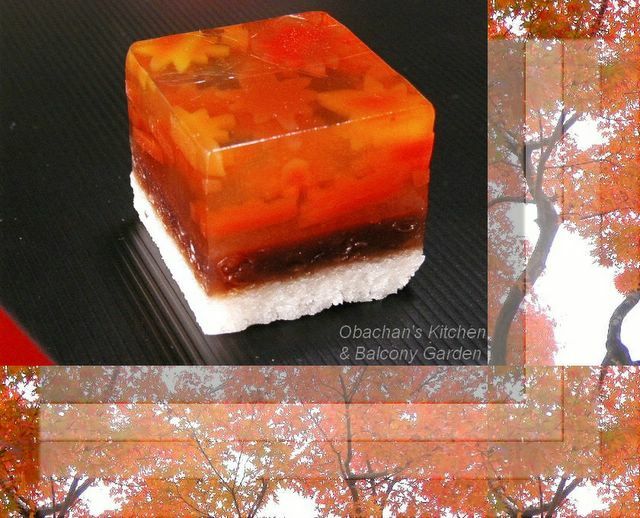 The top layer contains tiny maple-leaf shaped jellies in different colors. 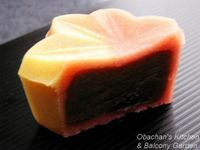 The middle layer is tsubuan (coarsely mashed azuki bean paste) jelly. 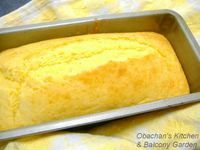 The white layer at the bottom seems to be made from domyoji-ko (coarsely ground dried glutinous rice) set with kanten. To make domyoji-ko, glutinous rice is first washed and soaked in water, then steamed, dried and milled. 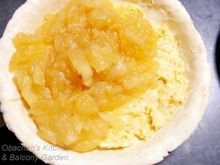 This rice powder gives a nice crumby texture to the kanten jelly, which is pleasant to the palate. The name of the powder is said to have come from a temple in Osaka, Domyoji temple, where the powder was first made. Another wagashi with the theme of momiji. This is nerikiri, the same type of Japanese confectionery as last month's entry. I just love the elegant color gradation on this sweet maple leaf. Well, here's a confession to make. 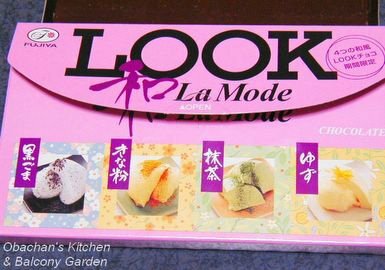 I took the shots of these sweets in the beginning of November with my old digital camera. The photos of maple leaves used as “outside drop shadow” around the wagashi photos were taken with my new camera last weekend. So this entry is actually a collaboration of the work of two cameras. 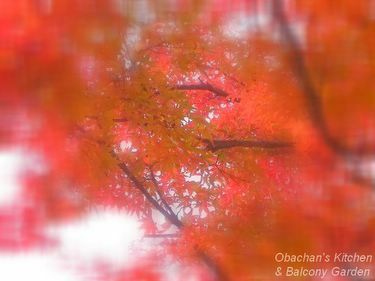 * To see more photos of autumn leaves, click here. I hereby announce that I just had my belated Thanksgiving dinner, and I’m officially stuffed now. 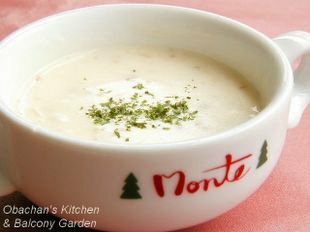 The reason why I still celebrate it alone here in Japan is explained in my 2004 Thanksgiving dinner entry, and the reason hasn’t changed. 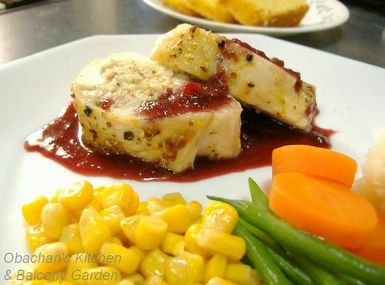 The menu this time was not too different from last year’s Thanksgiving dinner, but there were some improvements. 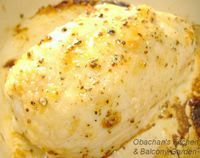 I made the same stuffed chicken breast, but for the stuffing I used this recipe today, because I’d always wanted to try making rice-stuffed chicken. I knew that the Thai rice I can find here will never be like wild rice, but I was willing to risk it. What’s more, hazelnuts called for in the recipe sounded absolutely tempting. As expected, the rice made the stuffing mushy, but it tasted pretty good because of the hazelnuts! I love hazelnuts in anything, but I wasn’t sure if they’d go with chicken. They did :) I’m so happy that I bought a small bag of hazelnuts at an imported food shop in Kobe (don’t ask me when). Maybe I shouldn’t have added a little honey to the cranberry sauce… It was just an idea that popped up in my mind at the last minute. 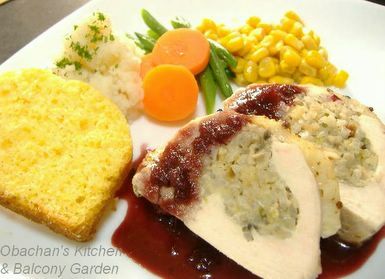 With the nutty flavor from the stuffing, I guess the sauce didn’t really need to be sweetened. Another change from last year was the vegetables. I cooked carrots and string beans, because last year the frozen green peas turned out terrible! Mashed potato was the same instant stuff as last year, but without gravy this time. Yep, apple pie again, but this year, I made an apple crumble pie. (Maybe I made a mistake in conversion?? My crumbles obviously had too much butter and didn’t crumble at all, so I ended up adding some extra flour and eventually sugar, too. :P) I didn’t want this pie to occupy my oven for too long, so I pre-cooked the apple slices and used a pre-baked pie shell from the store. 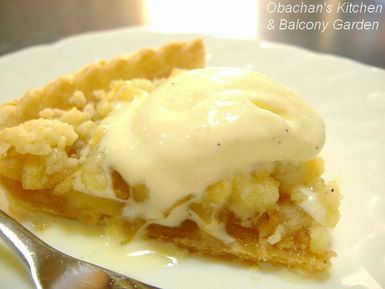 BTW, the ice cream I put on the warm apple pie had vanilla beans in it. Yay! I promise. I’ll get some exercise tonight…. * I uploaded some photos of autumn leaves here, if you want to take a look. So this is what I made today to celebrate. This batch was a bit too much for my small loaf pan, so I baked this using a square cake tin. It rose more than expected and the top cracked much more than expected. 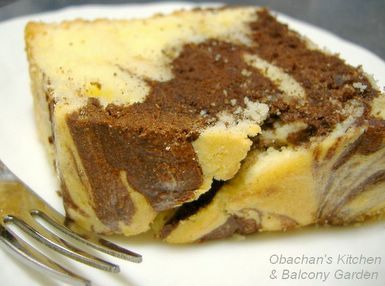 :P I should have added a little more milk to the batter actually … This cake tastes OK but I do need a warm drink when I eat this. 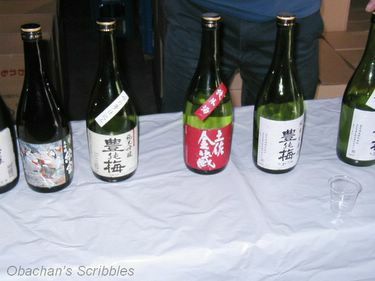 Last Saturday I had a chance to try “sake-tasting” at a local brewery. 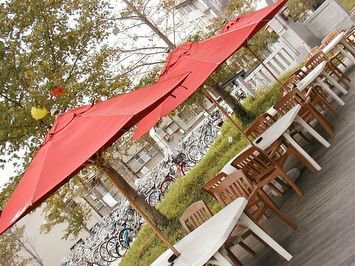 As I wrote in my another blog, it was an experience that changed my view on sake almost completely. I once tried a sweet sake that was known as “women’s favorite,” and thought it was too watery, so I categorized myself as a dry-sake drinker after that. But I don’t remember enjoying such a great combination of food and sake, as good as that of freshly deep-fried food and ice cold beer or French bread and wine. And I never bothered to experiment on different combinations, thinking that the taste of sake I hadn't tried cannot be too different from the ones I'd already tried. 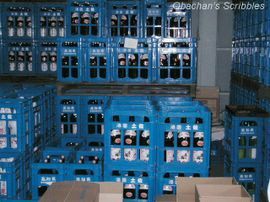 After seeing several rooms and equipments at the brewery, we were lead into a storage room where 7 or 8 sake bottles were waiting for us on a long table. For each bottle, the president first told us what kind of sake it was, and tasting followed using tiny plastic cups. The first two bottles were the same product, but different batches. The first one was, IIRC, their just-recently-extracted ginjo-shu that was waiting for the remaining sediment to settle to the bottom before bottling. When I tasted it, I understood for the first time what “fruity fragrance” meant. It was literally fruity, banana-like aroma, and it was by no means unpleasant. 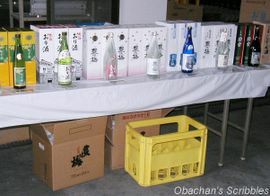 Then he let us taste the sake in the second bottle, which was the same product that had been stored for one year. Surprising! The sake tasted distinctively stronger, leaving the familiar sensation in the throat. It was definitely the taste I was more used to. The next one with red label on the bottle was the one specially made to be enjoyed during meal, he said. To me it was a little too light, but it might taste good when consumed with food. What came next was the same product as the first 2 bottles, but made from Kochi-grown sake rice. I think there was a slight difference in the flavor, but I don’t remember very well, because the one I tasted right after that gave me much stronger impression. The one that gave me a strong impression -- the one called "Ekin" named after a famous local painter -- was my No. 1 favorite of the day. It was daiginjo which was extracted by pressing, IIRC. To me it had the best balance of dryness, fruitiness and lightness among the sake I tried that day. 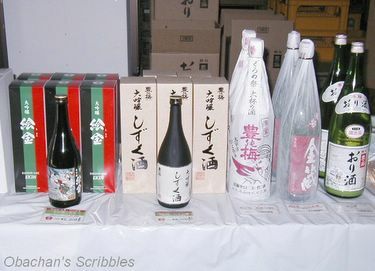 The next one (see photo) was actually the most expensive, "drip-pressed" daiginjo, extracted using the most authentic(?) and time- consuming method. This was definitely the kind that I can never afford in my everyday life, so I felt really lucky. But for me its taste was a little too light and elegant, and that's why I didn’t pick it as my “most favorite” when asked which one I liked the best. The last one we tasted was a liqueur with yuzu juice and β-glucan added. I didn’t know this before, but β-glucan is something found in agaricus mushrooms and supposed to be good for health, according to his explanation. Oh how I wish they would sell premium sake in much smaller bottles for a lower price so that I can try them one after another for experiments! It has been pretty cold for the past couple of days, and the pic of the ice cream in my last post was giving me a chill every time I saw it, to be honest. So, here’s more “seasonally correct”shot of my supper last night. (Uh…maybe not really correct for those living in the Southern hemisphere?) This is just a soup with whatever ingredients which were available in the kitchen yesterday. Nothing fancy, but at least, this is much more authentic than the retort pouch stuff I often depend on, I suppose. OK, my busiest time of the month is finally over and now I have time to write about the Japanese sauces I have in my kitchen, as requested by one of dear readers about two weeks ago. I don’t know if this is going to be helpful for anyone, but some people might, at least, find this interesting. Honestly I learned a lot from doing this, and I really thank Sara for bringing up this idea. 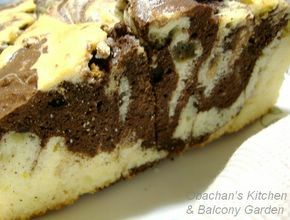 In this post, the ones with photos are the ones I actually have in my kitchen now. I also wrote about some popular variations, and tried to include some trivia that even Japanese people may not have heard of. Of course I’m no expert, so corrections and feedbacks from readers are highly appreciated! :) And I hope you enjoy this as much as I did. * For each entry, in front of the explanations, I put 1) possible product name in English, 2) its Japanese name spelled with the alphabet, 3) with Chinese characters, and 4) with hiragana (Japanese syllabary). * Information included in this post may not apply to the similar products sold outside Japan. Dark soy sauce, koikuchi shoyu 濃口醤油　こいくちしょうゆ: (See photo.) Real basic and versatile liquid seasoning made from soybeans. When a Japanese recipe calls for “soy sauce (shoyu, 醤油　しょうゆ）,” it usually means this type of soy sauce, unless the recipe specifically mentions other types of shoyu. Light soy sauce, usukuchi shoyu 薄口醤油　うすくちしょうゆ: Used for simmered/steamed dishes that shouldn’t be colored too brown with the sauce. 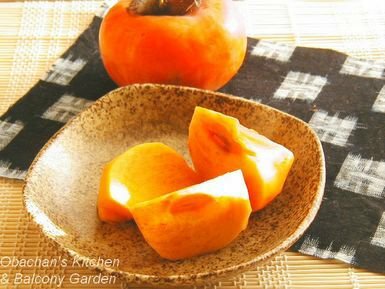 Though the color is lighter, its salt-content is higher than dark soy sauce. 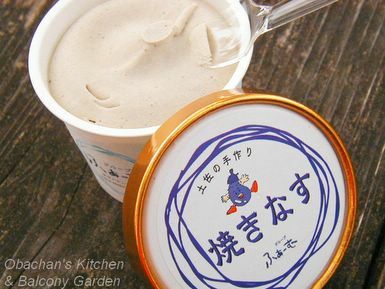 To make the saltiness milder, amazake (non-alcoholic? drink made from fermented rice) is added. More commonly used in Kansai area than in Kanto. They say the difference can be observed by comparing the color of noodle soup; Kanto-style noodle soup is much darker than Kansai-style soup. Tamari soy sauce, tamari shoyu 溜醤油　たまりしょうゆ:　Very dark, thick soy sauce used as dipping sauce for sashimi and sushi. White soy sauce, shiro shoyu 白醤油　しろしょうゆ:　Amber colored sauce mainly made from wheat. Contains more sugar than soy sauces made from soybeans. Not sterilized by heating, thus contains live yeast and expires faster than other kinds of soy sauces. Used for simmered/steamed dishes that shouldn’t be colored brown with the sauce. 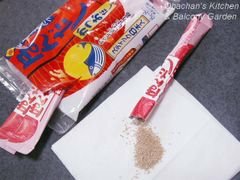 Dashi powder, hunmatsu dashi, 粉末だし ふんまつだし: I was really tempted to call this Hondashi ほんだし, but it’s a product name by a particular brand, like calling a photocopy machine “Xerox,” so I used a name that sounds more "generic" above. Anyway, I've found many miso-soup recipes written in English telling you to make dashi stock from dried bonito flakes and/or kelp. That’s a traditional, formal way, and probably the best way, but do you really think that we do that every morning?! Especially those busy housewives who have to cook breakfast and pack lunch for husbands and kids, and then go out for a part-time work? No way. Rice Wine, mirin 味醂　みりん:　Made from glutinous rice, malted rice and shochu (distilled spirit). Contains apx. 13 – 14% alcohol (thus, alcohol tax applied in Japan) and apx. 40% sugar and its color is similar to vinegar. Widely used for things like simmered food, teriyaki, soups, dressings, sweets, etc. 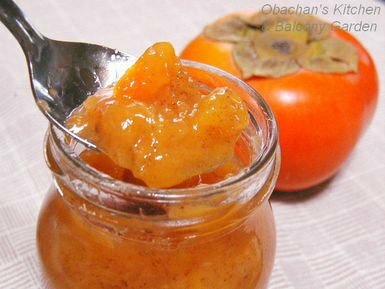 Essential for giving sweetness and glossy sheen to teriyaki-type of dish. 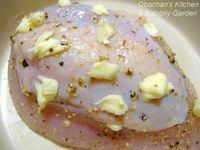 Various amino-acids and succinic acid contained add extra flavor, and the alcohol helps the food absorb the flavor of seasonings. 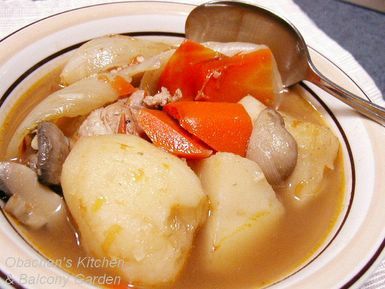 When the taste of alcohol is not desired, should be boiled briefly beforehand to let alcohol evaporate. Often called hon-mirin (本味醂 ほんみりん) to distinguish from mirin-like seasoning mentioned below. 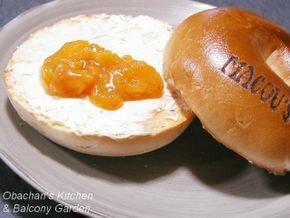 Mirin-like liquid seasoning, mirin-huu chomiryo みりん風調味料 みりんふう　ちょうみりょう:　Made by adding glutamic acid and other seasonings to thinned syrup (glucose sugar or starch syrup). Its alcohol content is less than 1%, and sugar content is higher than mirin. Not necessary to boil before using. Sake, sake 酒　さけ:　Now this is something I do but many Japanese housewives may not: I use drinking sake for cooking, not cooking sake (ryori-yo sake 料理用酒). It doesn’t have to be this brand in the photo, but it HAS TO be drinking sake. For me it makes a BIG difference in taste. Vinegar, su 酢　す:　Usually refers to the kind of vinegar made from several kinds of grains such as wheat, rice and corn. More precisely, this type is classified as grain vinegar, kokumotsu su 穀物酢 こくもつす. Most regular and inexpensive kind. Rice vinegar, komezu 米酢　こめず: Vinegar made from rice. A little milder and deeper flavor of this vinegar is said to be most suitable for Japanese traditional vinegared dishes, but this is a little more expensive than grain vinegar. Sushi vinegar, sushizu すし酢　すしず: Grain vinegar with sugar, salt and dashi-seasonings added. Basic ingredients necessary for seasoning sushi rice are already included, so you can make sushi rice by mixing this vinegar alone to warm rice (but I prefer mixing sushi vinegar my own way). 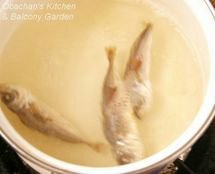 Ponzu sauce, Ponzu ぽん酢　ぽんず:　A sauce made by mixing ingredients including citrus juice, mirin, dashi-stock, soy sauce, and vinegar. The name came from a Dutch word, “pons” which means citrus (juice). Yuzu-mixed Ponzu, yuzu-pon ゆずぽん:　Ponzu with extra yuzu flavor. I have to have this when I eat nabe (Japanese hotpot dish). 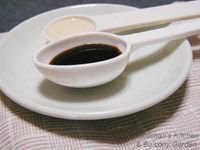 Worcestershire sauce, usuta- sosu, ウスターソース: If you eat at a casual eatery in Japan and see a small container on the table with a label saying simply “ソース(sauce),” it’s almost always Worcestershire sauce. 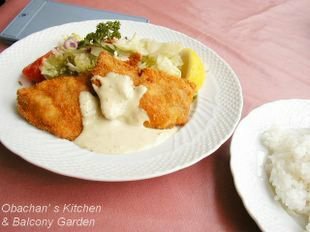 Tonkatsu sauce, tonkatsu sosu, とんかつソース:　Thicker and sweeter sauce made by adding a lot more fruits/vegetables than Worcestershire sauce. 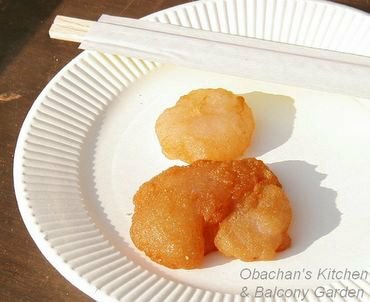 Good with cutlets, okonomi-yaki お好み焼き (Japanese savory pancakes) and takoyaki た こ焼き (octopus balls). 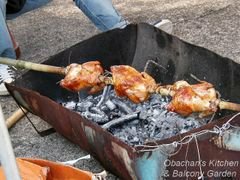 There are sauces specifically named “okonomi-yaki sauce” お好み焼きソース and "takoyaki sauce"　たこ焼きソース, too, but they are basically not too different from tonkatsu sauce, I think …just some difference in flavor, sweetness and/or thickness. An interesting try indeed, but to me all of these tasted just so-so. I like their fruit-flavored cream and nuts cream versions much better. Kochi University Faculty of Agriculture held an“Open Campus” last Saturday (November 5th). It was a friend of mine studying there who gave me the information about the event, and the moment I heard about the food stalls by international students, I told him, “I’ll be there!” For more details about the "open campus" event, click here. Unfortunately I had a previous engagement in the morning, so it was already past 2 pm when I arrived at the university. 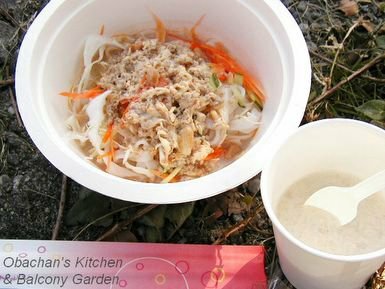 Starving, I headed straight for food stalls, and the first thing I bought was this “Mee Kati,” rice noodles seasoned with coconut milk, with a coconut gelatin dessert in a paper cup. I was told that they were Laos food (IIRC). The rice noodles were very good with the tasty toppings. 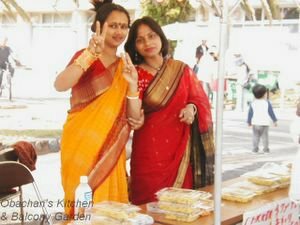 This was Bangladesh stall, I think, and they sold curry flavored rice and something like deep-fried dumplings. I only wanted the rice but they insisted that I buy both (one pack of each). After I ate about half of them, I realized that I forgot to take a photo, so I put what was left then in one pack and took this shot. The dumplings were good, but the rice was a bit too mushy for me. 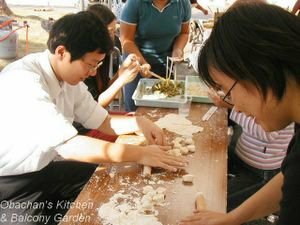 Chinese students making dumplings. I was already very full, so didn’t buy any. Can you imagine what these are? 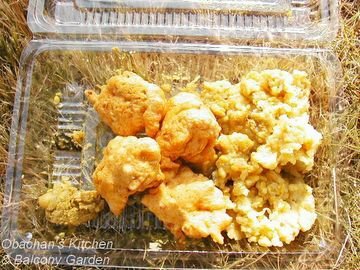 They look like warabimochi (bracken-starch dumplings) coated with soybean powder, but actually these dumplings were made from sago palm starch. The students studying about sago palm and its use experimented on making sweets using sago palm starch and finally came up with these dumplings. They were pretty close to warabimochi and I liked the taste. The students said they also tried kimchi-nabe (hotpot dish seasoned with kimchi) with the sago palm starch dumplings, only to find out that it was a too adventurous attempt. It was too bad that some foods were already sold out when I got there. Maybe next year I’ll be there before lunch time and try more foods. Out of all the dishes I tried that day, I liked Mee Kati the best. Gee, I should have asked for the recipe! 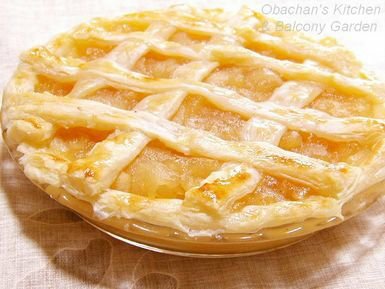 Those living in Japan now might have heard about “potato-apple pie” by “RaPoppo (らぽっぽ).” It’s a pie with double-filling of a layer of cooked apples on another layer of sweet-potato paste. 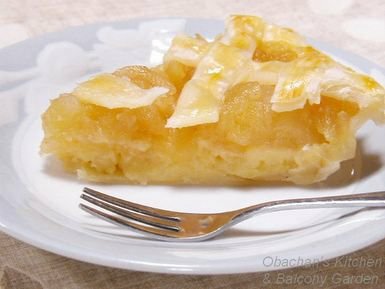 Inspired by their pie, which was my very favorite when I was living in Osaka, I made my version of sweet-potate apple pie today using frozen pastry sheets and a couple of kogyoku apples. 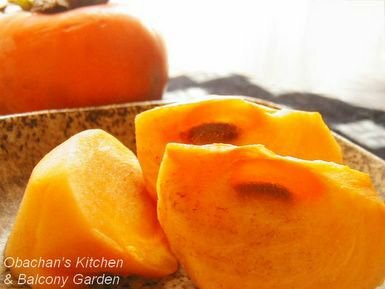 I used this Japanese recipe for the sweet potato filling. I had my lunch at a small restaurant at the community cultural center called “CulPort” today. There was a special event held there in relation to our national holiday, “Culture day,” and I didn’t feel like coming all the way back to my apartment just to eat lunch. At the restaurant named Monte, lunch set menu was served only until 14:00, and it was 13:59 when I went in and took a seat. I didn’t think I would be able to have a lunch set, but they said it was OK. 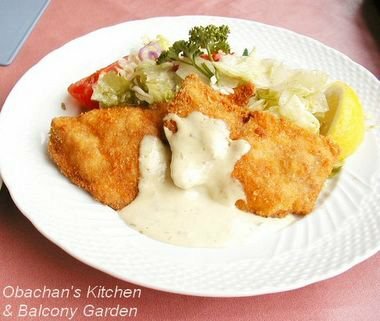 So I had a B-set which consisted of a bowl of chowder, breaded and deep-fried fish, salad and rice. I was very pleased with their nice service, but the meal was just so-so. It was too bad that the weather was not very nice today. One of these days I might come back again to enjoy a nice coffee break at one of those tables right outside the restaurant. It must be a nice way to spend an autumn afternoon.